When it comes to feudal Japan social hierarchy, there are a lot of things that are significantly different from today’s society in Japan and in the Western country. For example, merchants and artists in feudal japan were considered at the very bottom of the hierarchy. There are, however, surprisingly some similarities, also. For instance, both the feudal Japan hierarchy and of today’s are represented in a pyramid shape, meaning there is only one who is at the very top of the hierarchy, the ruler. The number of people in each class increases as the class gets lower. In feudal Japan, there were three main classes and within each class, there were sub categories. The main social classes in feudal Japan were the royal class, the noble class and the lower class. Around 90% of the society belonged in the lower peasants class, with the rest being in the noble military class. 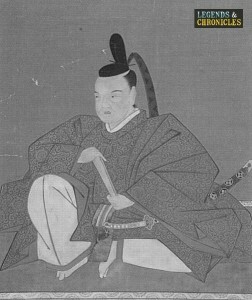 An illustration of daimyo Kyogoku Takatomo, a high ranking figure in feudal Japanese hierarchy. The royal class was at the top of the chain, and it was also the one included the emperor and his family members. Although the emperor was classed as the leader of feudal Japan, he actually had very little power and control over the country, as the government was dominated by the military force. The emperor was seen more like a figurehead, and had large symbolic religious influential figure to the Japanese people. However, as the time went on towards the end of the feudal Japan in the Edo period, the emperor regained the power. The royal family were those who were related to the emperor. The royal family members were classed the second highest social class in the royal class. Again in reality, they were not very powerful compare to the ones in the military class during the feudal period in Japan. The nobles, those in the military class are equivalent to the middle class in today’s society. Although the noble class was below the royal class in the feudal Japan hierarchy, the people in this class were the ones ran the country in reality, making them more powerful figures. The sub categories of the military class included the shogun, the daimyos, the samurais and the ronins. The shogun was the highest class in the noble class. They were also the military and political leader of feudal Japan and held the most power. The shoguns were appointed by the emperor and simply meant a ‘general’ originally, however, the shoguns gained the highest rank during the feudal period due to their physical strengths. Shoguns were Japan’s ruler until its abolishment just before the beginning of the Meiji period. Some of the notable shoguns in feudal Japan include, Minamoto no Yoritomo, Shikaga Takauji, Ashikaga Yoshimitsu, Tokugawa Ieyasu and Yokugawa Yoshonobu who became the last shogun. Daimyos, also known as feudal warlords, were categorised just below and reported directly to the shogun, making them also very powerful rulers. Daimyos were in fact more powerful than shoguns at times. How strong the shoguns completely depended on how many daimyo they had under them. The word daimyo originally meant large private land owners. They had a lot of advantages over others, for instance, they were exempt from paying any taxes. Some of the most legendary military figures in feudal Japan were daimyos including Oda Nobunaga and Toyotomi Hideyoshi who were both seen as strong country rulers. Samurais, best described as warriors or soldiers in feudal Japan were those hired by daimyo in order to protect them from other daimyos. Samurais were also known as buke or bushi. Samurais were seen as brave and privileged class in feudal Japan as only less than 10 percent of the people in the period belonged in this social class. Samurai warriors were very royal to their leaders or more suitably called employers. When their daimyo either died, defeated in a battle, the samurais under the daimyo became ronins. How powerful a daimyo depended significantly on how many samurais he had. 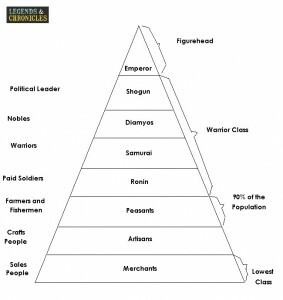 A visual hierarchy of the feudal Japanese social structure. Ronins were the lowest class in the noble military class in the feudal Japanese era. Ronins were simply those samurais who did not belong to any masters, daimyo. There could have been a number of different reasons to how these soldiers became ronins, for example, due to the death of their previous daimyo from losing a battle. Freelance workers in today’s society are often compared to ronins who worked for multiple employers. The majority of the population, roughly 90% of the people in feudal Japan were in the lower class. As the name suggests, this was the lowest social class of all. The sub categories within the lower class included, peasants, artisans and merchants. Peasants were ranked at the top of the lower class, including farmers and fishermen. Although peasants in feudal Japan were often poor, they were regarded highly of as they produced rice for samurais and daimyos. However, due to the price of the food and the taxes they had to pay, they could rarely afford to eat rice. Unlike those in higher social classes, they were forced to dress very simple often made from hemp. Artisans, often known as craftsmen, were ranked below peasants in the feudal Japanese society. Although they became more powerful throughout the feudal period, at the beginning, they were considered one of the lowest sub categories in the hierarchy. Some of the professions of this social class included musicians, actors, entertainers, singers, painters and sculptors. Merchants were also in the lowest social class in feudal Japanese hierarchy. One of the reasons why people looked down on them was because they were selling things that other people had made, and taking money from other people in a dishonest way. Although they were unpopular with the majority and were in the lowest social class, they were wealthy and therefore, were considered as one of the most benefiting classes of feudal Japan. There were several other types of people who belonged in the lower social class in feudal Japan. These included etas(executioners), hinins(criminals) and prostitutes.